The Avatars were immortal and lived like kings - even though their empire was dying. Their immortality was guaranteed by magick crystals, crystals whose influence was now waning, overwhelmed by the power of a great flood and a freak ice age. But when two moons appeared in the sky, and the ruthless armies of the Crystal Queen swarmed across the land, brining devastation and terror, the Avatars united with their subjects to protect their universe. As the cities faced imminent destruction, three heroes emerged. Talaban, a warrior haunted by tragedy. 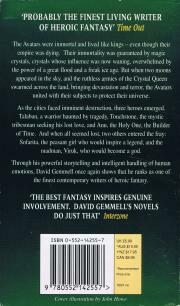 Touchstone, the mystic tribesman seeking his lost love, and Anu, the Holy One, the Builder of Time. And when all seemed lost, two others entered the fray: Sofarita, the peasant girl who would inspire a legend, and the madman, Viruk, who would become a god. 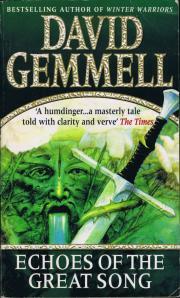 Through his powerful storytelling and intelligent handling of human emotions, David Gemmell once again shows that he ranks as one of the finest contemporary writers of heroic fantasy.